The Mahabharatha, is the greatest, longest and one of the two major Sanskrit epics of ancient India, the other being the Ramayana. With more than 74,000 verses, plus long prose passages, or some 1.8 million words in total, it is one of the longest epic poems in the world. It contains eighteen Parvas or sections viz., Adi Parva, Sabha Parva, Vana Parva, Virata Parva, Udyoga Parva, Bhishma Parva, Drona Parva, Karna Parva, Shalya Parva, Sauptika Parva, Stree Parva, Shanti Parva, Anushasana Parva, Asvamedha Parva, Ashramavasika Parva, Mausala Parva, Mahaprasthanika Parva and Swargarohanika Parva. Each Parvacontains many sub-Parvas or subsections. This wonderful Grantha (Sacred book) was composed by Bhagvan Sri Veda Vyasa (Krishna Dvaipayana) who was the grandfather of the heroes of the epic. He taught this epic to his son Suka and his disciples Vaisampayana and others. King Janamejaya, son of Parikshit, the grandson of the heroes of the epic, performed a great sacrifice. The epic was recited by Vaisampayana to Janamejaya at the command of Vyasa. Later on, Suta recited the Mahabharata as was done by Vaisampayana to Janamejaya, to Saunaka and others, during a sacrifice performed by Saunaka in Naimisaranya. It is very interesting to remember the opening and closing lines of this great epic. It begins with: “Sri VedaVyasa sang of the ineffable greatness and splendour of Lord Vasudeva, who is the source and support for everything, who is eternal, unchanging, self-luminous, who is the Indweller in all beings, and the truthfulness and righteousness of the Pandavas.” It ends with: “With raised hands, I shout at the top of my voice; but alas, no one hears my words which can give them Supreme Peace, Joy and Eternal Bliss. One can attain wealth and all objects of desire through Dharma (righteousness). Why do not people practise Dharma? One should not abandon Dharma at any cost, even at the risk of his life. One should not relinquish Dharma out of passion or fear or covetousness or for the sake of preserving one’s life. BHAGAVAN VYASA, the celebrated compiler of the Vedas, was the son of the great sage Parasara. It was he who gave to the world the divine epic of the Mahabharata. Brahma extolled Vyasa and said: “O sage, invoke Ganapati and beg him to be your amanuensis.” Having said these words he disappeared. The sage Vyasa meditated on Ganapati who appeared before him. Vyasa received him with due respect and sought his aid. Ganapati smiled and agreed to the condition. Then the sage began to sing the story of the Mahabharata. He would occasionally compose some complex stanzas which would make Ganapati pause a while to get at the meaning and Vyasa would avail himself of this interval to compose many stanzas in his mind. Thus the Mahabharata came to be written by Ganapati to the dictation of Vyasa. It was before the days of printing, when the memory of the learned was the sole repository of books. Vyasa first taught the great epic to his son, the sage Suka. Later, he expounded it to many other disciples. Were it not so, the book might have been lost to future generations. Tradition has it that Narada told the story of the Mahabharata to the devas while Suka taught it to the Gandharvas, the Rakshasas and the Yakshas. It is well known that the virtuous and learned Vaisampayana, one of the chief disciples of Vyasa, revealed the epic for the benefit of humanity. Janamejaya, the son of the great King Parikshit, conducted a great sacrifice in the course of which Vaisampayana narrated the story at the request of the former. Afterwards, this story, as told by Vaisampayana, was recited by Suta in the forest of Naimisa to an assembly of sages under the lead of the Rishi Saunaka. Suta addressed the assembly: “I had the good fortune to hear the story of the Mahabharata composed by Vyasa to teach humanity dharma and the other ends of life. I should like to narrate it to you.” At these words the ascetics eagerly gathered round him. Suta continued: “I heard the main story of the Mahabharata and the episodic tales contained therein told by Vaisampayana at the sacrifice conducted by King Janamejaya. Afterwards, I made an extensive pilgrimage to various sacred places and also visited the battlefield where the great battle described in the epic was fought. I have now come here to meet you all.” He then proceeded to tell the whole story of the Mahabharata in the grand assembly. After the death of the great King Santanu, Chitrangada became King of Hastinapura and he was succeeded by Vichitravirya. The latter had two sons, Dhritarashtra and Pandu. The elder of the two being born blind, Pandu, the younger brother, ascended the throne. In the course of his reign, Pandu committed a certain offence and had to resort to the forest with his two wives where he spent many years in penance. During their stay in the forest, the two wives of Pandu, Kunti and Madri gave birth to five sons who became well known as the five Pandavas. Pandu passed away while they were still living in the forest. The sages brought up the five Pandavas during their early years. When Yudhishthira, the eldest, attained the age of sixteen the rishis led them all back to Hastinapura and entrusted them to the old grandsire Bhishma. In a short time the Pandavas gained mastery over the Vedas and the Vedanta as well as over the various arts, especially pertaining to the Kshatriyas. The Kauravas, the sons of the blind Dhritarashtra, became jealous of the Pandavas and tried to injure them in various ways. Finally Bhishma, the head of the family, intervened to bring about mutual understanding and peace between them. Accordingly the Pandavas and the Kauravas began to rule separately from their respective capitals, Indraprastha and Hastinapura. Some time later, there was a game of dice between the Kauravas and the Pandavas according to the then prevailing Kshatriya code of honor. Sakuni, who played on behalf of the Kauravas, defeated Yudhishthira. As a result, the Pandavas had to be in exile for a period of thirteen years. They left the kingdom and went to the forest with their devoted wife Draupadi. According to the conditions of the game, the Pandavas spent twelve years in the forest and the thirteenth year incognito. When they returned and demanded of Duryodhana their paternal heritage, the latter, who had in the meanwhile usurped their kingdom, refused to return it. War followed as a consequence. The Pandavas defeated Duryodhana and regained their patrimony. The Pandavas ruled the kingdom for thirty-six years. Afterwards, they transferred the crown to their grandson, Parikshit, and repaired to the forest with Draupadi, all clad humbly in barks of trees. 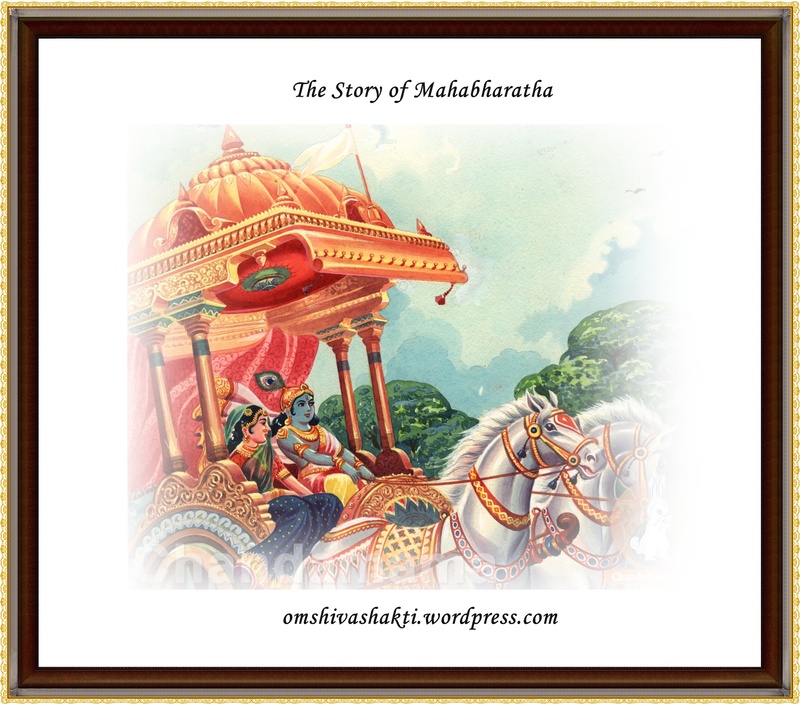 This is the substance of the story of the Mahabharata. In this ancient and wonderful epic of our land there are many illustrative tales and sublime teachings, besides the narrative of the fortunes of the Pandavas. The Mahabharata is in fact a veritable ocean containing countless pearls and gems. It is, with the Ramayana, a living fountain of the ethics and culture of our Motherland.